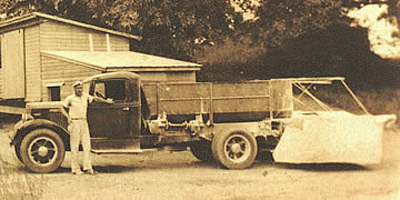 Stoltz Manufacturing, a leading manufacturer of construction and agricultural spreaders, marks its 70th anniversary during 2015, enjoying on-going success with the breakthrough agricultural lime spreader invented by founder Christian Umble (“C.U.”) Stoltzfus in 1945 following the end of World War 2. Today, Stoltz Manufacturing makes more than two dozen different agricultural and construction site spreaders—each based on the original concept--that are sold mostly in the United States, but also in other countries. Nearly 5,000 are in operation. Many owners cite the durability and ruggedness of Stoltzfus spreaders, which operate for decades in the toughest of operating conditions, according to Bernard Hershberger, the company’s president representing the third generation of the family. 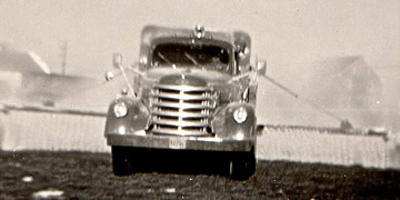 Hershberger said in 1945, Stoltzfus was a Morgantown area 33-year-old farmer and a limestone quarry operator who sought a way to minimize the dust clouds generated when he spread lime on his fields. He built a truck-mounted drop spreader that distributed powered lime, bone meal and rock phosphate close to the ground through evenly spaced holes in metal booms, each extending 15 feet horizontally from the machine’s centre. His first five-ton, tractor-drawn spreader initially sold to farmers in Pennsylvania Dutch country, allowed a faster, more accurate and efficient pattern over a wide area. Though his design has been updated and refined over 70 years, it remains the benchmark process for applying dry flowing materials, including lime which is essential to growing crops because it neutralizes the soil’s acidity. Stoltzfus’ ingenuity continued. In 1976 he invented a wet lime spreader, enabling farmers to backhaul truckloads of inexpensive lime, stockpile it in their fields and apply it when conditions were favourable. The spreader was capable of applying four tons of wet lime per acre. 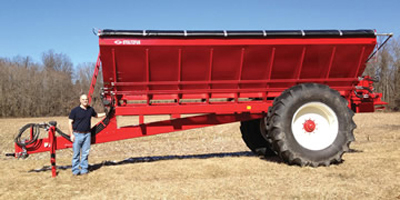 Spreader sales doubled for the company. 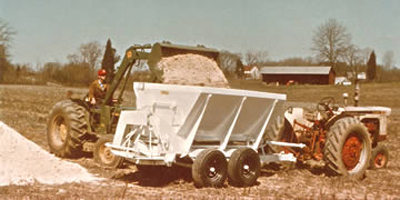 Ten years later, Stoltzfus perfected his bulk material spreader that could accommodate not only lime, but also bulkier materials such as chicken litter, bio solids and compost—the first spreader to combine these fertilizers in a single machine. In 1991, Stoltzfus introduced the Redhawk Ground Driven Spreader, the first with a dual-contact press wheel that combined the load breakout strength of his wet lime spreader with the accuracy of a ground-driven machine. In 1995, the company introduced its second distinct product line of pneumatically loaded soil stabilization spreaders to the construction industry. Sold under the Stoltz Site Spreader and brand name, they also revolutionized an industry as construction companies were finally able to apply large quantities of lime, cement, fly ash, quick lime and other materials accurately and with minimal dust. Site spreaders are mainly used for soil stabilization and remediation and full depth reclamation work. A few years later, the company introduced yet another significant product, the Stoltz Site Spreader Controller, which combines all spreader control functions into a single interface. Initially designed for the company’s low-dust dual auger style spreaders, it has been adapted to the conveyor chain-style spreaders. The company was incorporated as C.U. Stoltzfus Mfg., Inc. in 1968.